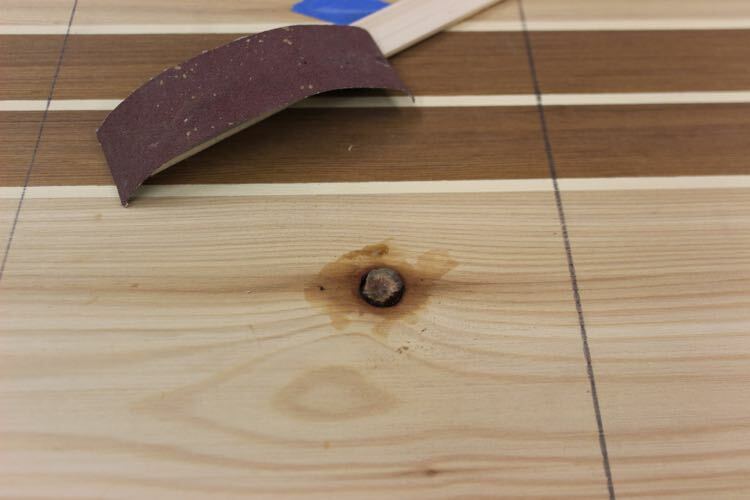 Sometimes the perfect lumber isn’t perfect without help. When I first started building hollow wood paddleboards I used clear knot free lumber but I hardly ever pick those perfect timbers now. Knots add character and the most interesting grain patterns happen near imperfections in wood. 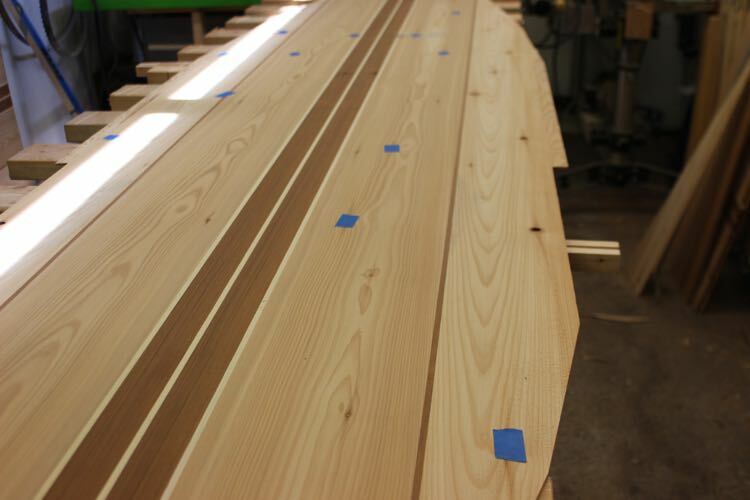 Perfectly straight clear lumber sometimes ends up looking like a manufactured veneered product. Hiding under the blue tape in the image above are all the imperfections that have been fixed on this panel. The knots are not a problem if they are locked in place early. Knots are slightly more work to shape (knots have a harder density than the rest of the wood) but the extra work is worth it. 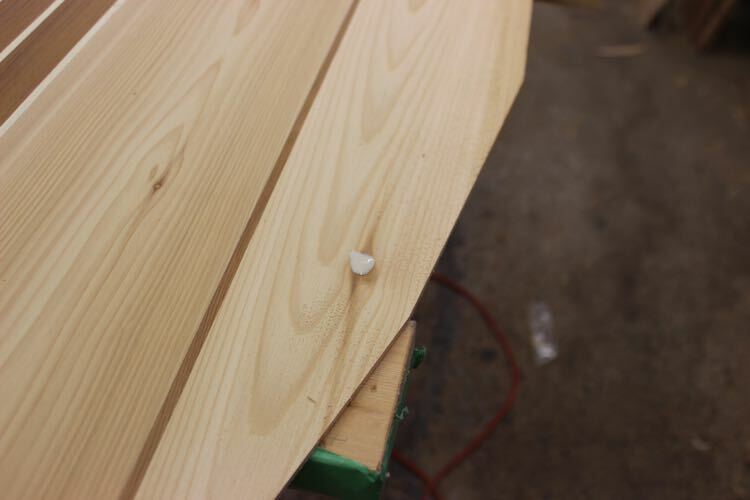 If you are planning on working with less than perfect lumber, this tutorial will teach you how to lock imperfections in place so they won’t cause problems later. For knots that appear tight you can lock them in place with Titebond 3 or epoxy. This will ensure the knots remain tight during the build. Knots that are loose or small missing knots can be fixed with epoxy. 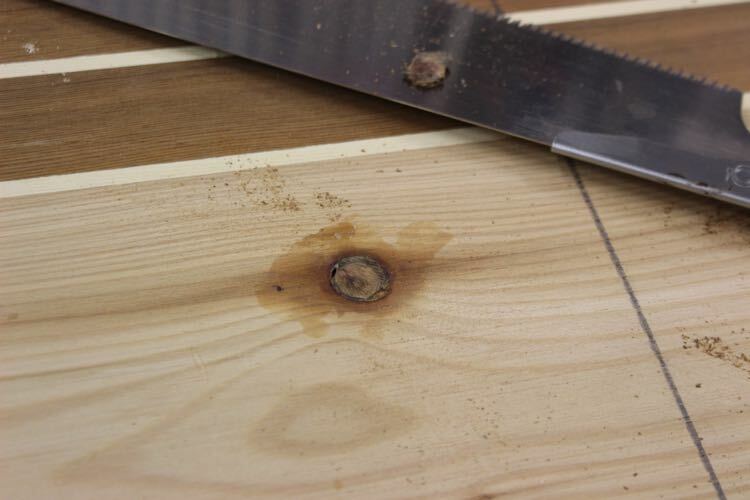 Small epoxy filled knots are virtually invisible on the finish board as they pick-up enough color from the surrounding hole to appear like the knot is still in the hole. 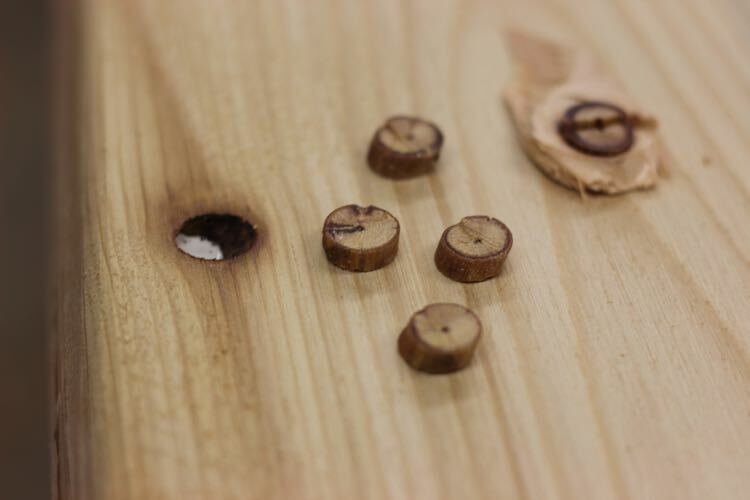 Missing holes can be filled with custom fitted knots. 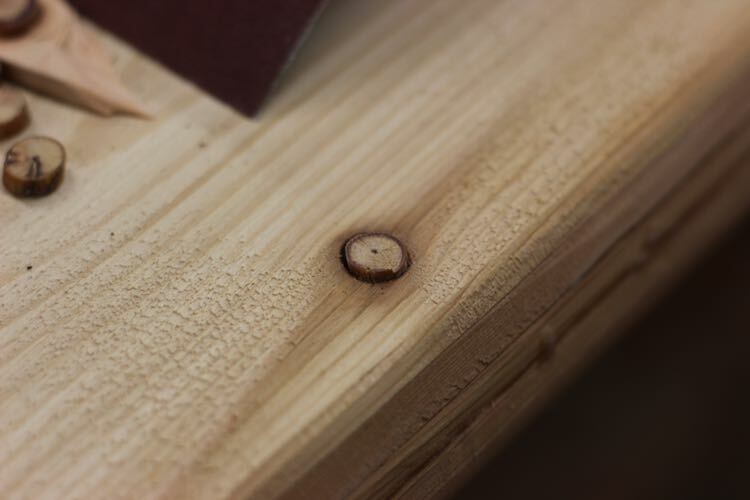 The knot pictured above was reshaped with a chisel from a similarly sized knot found on the floor of the workshop. The bottom of the hole is sealed with painters tape and then the roughly fitting knothole is filled with epoxy. 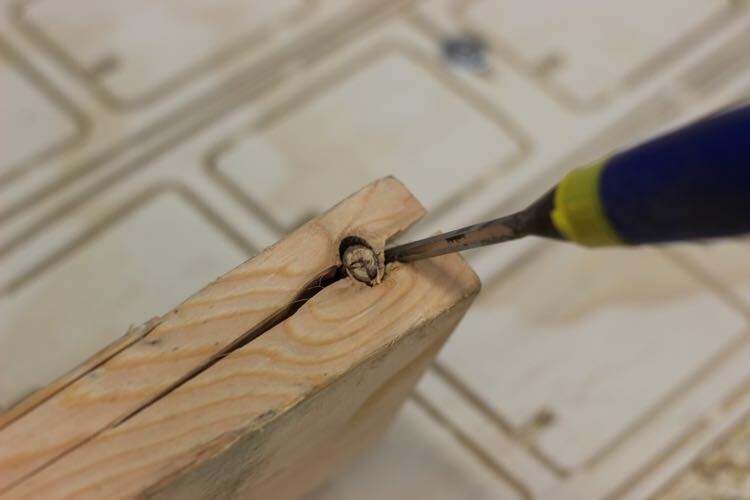 Once the epoxy is cured the knot can be cut flush with a Japanese saw. 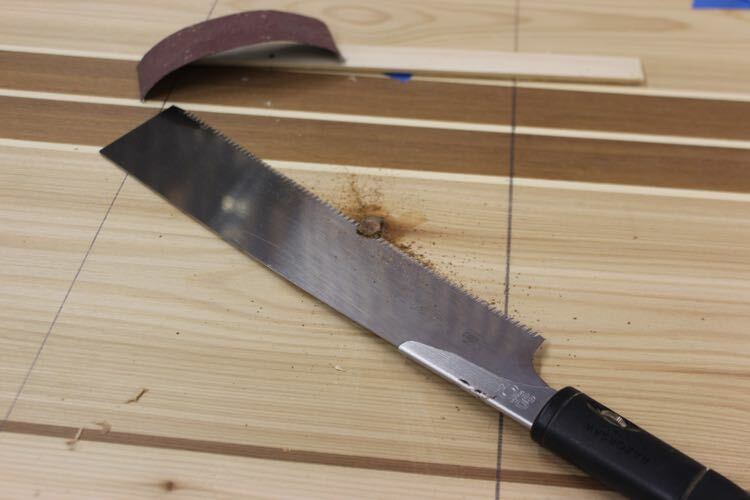 A razor saw with short spine can be used like a flush cut saw for tasks like this. Much better than a nickel sized hole! This is NOT the easiest way to get replacement knots! Replacement knots are easy to find. They do not have to come from the same piece of wood or even the same species. 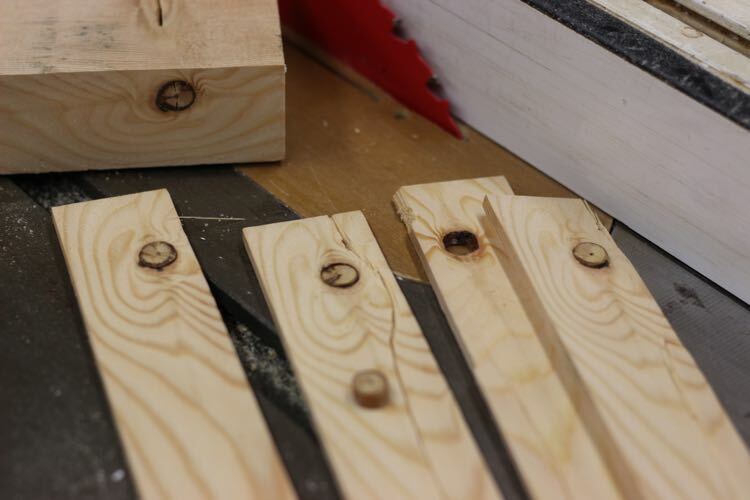 The end of a Spruce 2×4 was used for the knots pictured below. Cutting strips just slightly thicker than the skins makes popping the knots much easier. Finding the best fitting knot. Once filled with epoxy it is very difficult to tell the originals knots from the replacements.